SUICIDE. The word caught your attention, didn’t it? The truth is, suicide catches everyone’s attention. It’s the actions leading up to suicide that often go unnoticed. Suicide is the 10th leading cause of death in the United States. Rates have spiked more than 30 percent since 1999 and continue to rise across genders, race and age. In young people between the ages of 10 and 24 suicide is the third leading cause of death. The Centers for Disease Control and Prevention reports suicide rates among children between the ages of 10 and 17 increased 70 percent from 2006 to 2016. This is a disturbing trend that has become a public health crisis. In 2016 45,000 people died by suicide in the US—more than twice the number of homicides. Worldwide more than 800,000 people die from suicide. To put that number in perspective, it means one death occurs every 40 seconds. In addition to the increase in suicides, the CDC reports a 42 percent increase in emergency hospital visits for self-harm; the main risk factor for suicide. Why? Because for a person who has decided to end their life, emotional burden is not enough, it also requires the capacity to harm yourself. That person must overcome intense emotional anguish to complete the act. The deaths last week of fashion designer Kate Spade and celebrity chef and author Anthony Bourdain have brought the issue of suicide into the spotlight. It casts a harsh light on two successful people who seemingly had it all, yet chose to end their lives. And it opens and elevates the discussion for the thousands whose names we don’t know. The one question asked without exception is why? While there is no single factor that leads to suicide, relationships, financial troubles, and unresolved issues from childhood are contributing factors. Statistically and historically mid-western states have some of the highest rates of suicide, which may be related to rural locations still experiencing economic downturns. Rural areas are isolated and have been hardest hit by the opioid epidemic. Addiction plays a major role in suicide. Chief among the factors affecting suicide victims is failure to get help. We don’t talk about mental illness, and the stigma prevents sufferers from seeking treatment that could prevent suicide. Treatment is not as readily available as it once was due to budget cuts made by the current administration. The Fiscal Year 2019 budget requests $68.4 billion for the Department of Health and Human Services (HHS), which is a $17.9 billion (or 21 percent) decrease from the 2017 enacted level. Lack of access to mental health care may explain the high number of people who die by suicide without being diagnosed with a disorder. Even for those who seek treatment it can still be a struggle to find a therapist, the correct balance of medication and be able to manage the high cost of both. Not everyone who struggles with mental illness has been diagnosed and some people choose not to seek professional help. 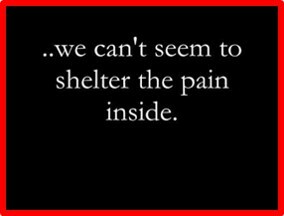 The shame that surrounds mental illness keeps those who need it the most from obtaining treatment. Millions of Americans are affected by mental health conditions every year. Statistics from the National Institute of Mental Health indicate the number of adults with any diagnosable mental disorder within the past year is1 in 5, or roughly 43 million. Experts believe existing data under-represents the real extent of mental illness in America. These are staggering numbers and it was hard to believe them. I looked for contradictions, but each web site I checked confirmed them. That means if I am in a room with five of my friends and four of them are fine, I’m the one that isn’t. 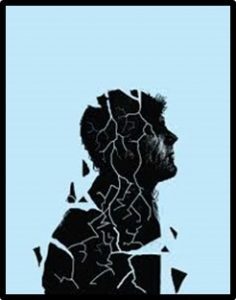 Nearly 10 million American adults (1 in 25) have serious functional impairment due to a mental illness, such as psychotic or anxiety disorders. 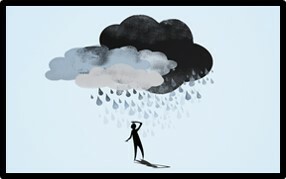 Equally shocking is 1 in 5 children from ages of 13-18 (20 percent) have or had a seriously debilitating mental disorder. The recent suicides of fashion designer Kate Spade and celebrity chef and author Anthony Bourdain offer a reality check and a reminder that no one is immune from the darkness that causes a person to take their own life. Even people with the most fulfilled lives still feel the urge to end them. Despite a rewarding adult life many suicides are the result of an inability to make peace with the past. A person who decides suicide is the only option available is trying to take control of their destiny and alleviate their suffering, which can only be accomplished by death. Survivors of suicide attempts say it was not about their desire to die as much as it was their desire to stop living. The human mind is a powerful thing. The mental skills that separate us from other animals and give us the ability to reason are the same tools that allow a person to contemplate a future that is terrible enough to end their life and then act on it. The wounds suicide leaves in the lives of those left behind are deep and long lasting. It is never the right answer and remains a permanent solution to a temporary problem. Pay attention to the people you know. An unwillingness to notice, listen, and ask questions only helps to perpetuate the stigma surrounding mental illness.